Exploit acquisition firm Zerodium on Monday announced that it’s offering significantly higher payouts for many types of exploits, including up to $2 million for remote iOS jailbreaks and $1 million for vulnerabilities in popular chat applications. Zerodium is now prepared to pay up to $2 million for persistent iOS jailbreaks that can be executed remotely without any user interaction – the amount has been increased from $1.5 million. Hackers can now earn $1.5 million for a remote iOS jailbreak that requires minimal user interaction (i.e. one click). Payouts for remote code execution vulnerabilities affecting WhatsApp, iMessage or SMS/MMS applications have now doubled to $1 million. 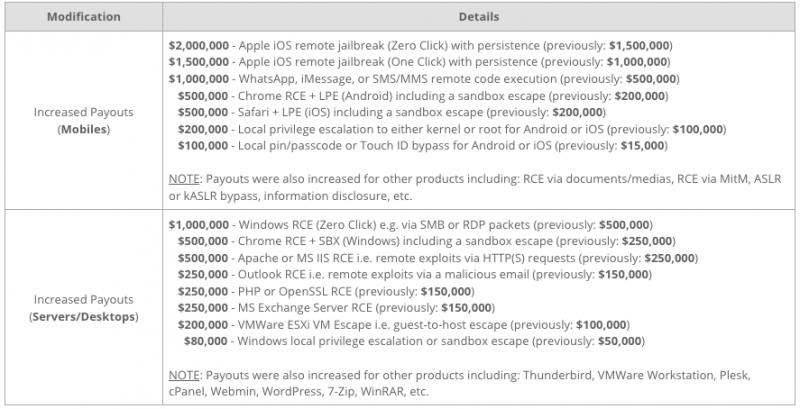 Researchers can earn half a million dollars if they sell their Chrome (on Android) and Safari (on iOS) exploits to Zerodium, but their exploits must include remote code execution, privilege escalation and a sandbox escape. It’s also worth noting that local PIN or TouchID bypass techniques for Android and iOS devices are now worth up to $100,000, a significant increase from the $15,000 offered by Zerodium until now. In the desktop and servers category, the zero-day exploit broker has doubled the maximum payout – from $500,000 to $1 million – for a Windows exploit chain that achieves remote code execution via SMB or RDP packets without any user interaction. Rewards have also doubled, to $500,000, for Chrome, Apache and Microsoft IIS exploits. Zerodium has also added $100,000 to rewards for remote code execution flaws in Outlook, Microsoft Exchange Server, PHP and OpenSSL. Zerodium says its zero-day exploits can only be acquired by a very limited number of governments and corporations, but these types of services have been highly controversial due to the potential for abuse.